For underachieving students from ages 10 to 22. 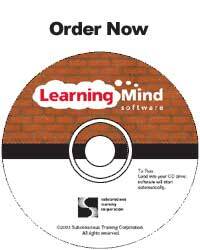 And in just 7 minutes a day, this remarkable "Mental Training" Software will help your child become the kind of student he or she is capable of being. Build Self-Confidence. This special session helps build your child's self-esteem. And with it, the power to learn. You'll see the change for yourself in no time. Better Concentration. A absolutely amazing session that will help your child develop strong powers of concentration -- and gain an ability to grasp information that is truly incredible. Take Notes Effectively. The act of writing down important points dramatically improves retention. Session Two helps your child perfect this act. Enhanced Memory. There's a simple technique that improves the natural capability of the mind to store information - and this important session teaches it. As incredible as it may seem, it really works! Better Writing Skills. Good creative and report writing are a skills that can be learned. This key session helps your child learn those skills-crucial to success in school. Stress Reduction. This remarkable session imparts the techniques for replacing stress with calm so the student can think more clearly, more logically. Confident Test Taking. Is your child traumatized by tests? Session Six will help your student take tests in a relaxed and confident manner -ready to recall all that he or she has learned. Superior Study Habits. All the elements of proper study habits all in one super session to help the student become more disciplined and more organized. This one session will change homework habits as you know them. And for the better! Improved Reading Skills. Good reading habits are essential to good learning. Even comprehending the "tough stuff" comes easily after this session. Time Management. This invaluable session helps your child learn to control his or her time-so there's plenty of time to do everything that needs to be done.